In the end, today was definitely ONE OF THOSE DAYS. 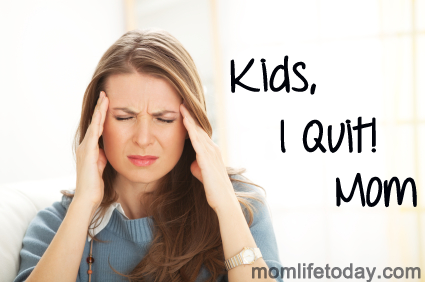 Exhausting, I want to run away from being a mom days. Oddly, it started well enough considering my mild hang over from too much wine and carbohydrates at Ladies Comedy Night. We went to church as a family and my daughter did a great job singing to the congregation in the Cherub Choir. After, my daughter and I headed to my parents where we picked up my mom, went out to lunch (SmashBurger Jersey Burger is a burger you dream about) and enjoyed a performance of Fancy Nancy where my mom purchased her a Fancy Nancy wand. Happy faces headed back to my parents, and that folks, is where the bottom dropped out. Fancy Nance wand revoked. Silent car ride home (not the worst). More yelling (by her, I am on a no yelling kick). And more tears. Lots and lots of tears. And a chorus of “you’re the worst mommy ever!”. (Seriously kid? You ain’t seen nothing yet. I am going to get so much worse in about 10 more years!) It is exhausting. It made me want to go into my room, lock my door, and not be a mommy for some period of time. Things calmed down and then reared their ugly head again during the bedtime routine. More yelling. More tears. More threats I cannot even understand through the tears. Sigh. Today felt like a day where I should have earned combat pay. I want to crawl into bed and sleep and sleep. I don’t even care that it is Monday tomorrow. Monday means I get to go to work. A place where, in general, nobody yells, cries, stomps their feet or issues silly ultimatums directly to me. A place where I don’t have to ask anyone the last time they went potty or turn down the 1,000 request for a snack. As Scarlet O’Hara said… “tomorrow is another day.” I pray that it is a day like we had last week where I truly felt the joy in being a mom. Good night everyone!